Like King of the Vagabonds, Odalisque opens with a step backwards. It’s Daniel Waterhouse’s turn in the spotlight again, specifically attending the death of Charles II in February 1685. 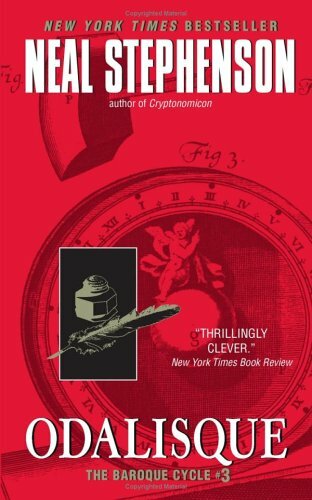 As in Quicksilver, this strand delves into the scientific happenings of the day – notably the eventual publication of Principia Mathematica, complete with a review from Leibniz that basically predicts special relativity – but the primary focus, I felt, was the politics leading up to the Glorious Revolution of 1688. It’s the same in the book’s second strand, which picks up Eliza’s story in Versailles, where she appears to be working as a governess but is fairly quickly really working as a sort of financial manager to half the resident nobles, and all the time really really working as a spy, sending letters encrypted in a cypher she knows is broken to William of Orange (and, for reasons that I missed, letters encrypted in a much stronger cypher to Leibniz). Two very different courts, then, and although there are some similarities in how the two strands unfold — such as the complete uselessness of royal physicians — of course there are two different outcomes, for in France the story is of a rebellion quashed. The title at first suggests we’re going to be primarily reading Eliza’s story, and certainly her continuing progression from slave to noble takes up more pages than Daniel’s antics; but I think the title also has a more ironic sense, which ties in with the exploration of freedom in King of the Vagabonds, in which both Daniel and Eliza are slaves to the increasing complexity of the world. On finishing Odalisque, which is the last part of the volume Quicksilver, I am struck by two main thoughts. First, I feel entirely vindicated in, and indeed grateful for, my decision to consider the volume as three novels: it simply makes no sense as one. It may be that The Baroque Cycle as a whole should be considered as a single, three-thousand-page novel, but it certainly isn’t three thousand-page novels. There’s no sense in which the volume as a whole achieves closure – but the individual books that make up the volume do, at least as much as, say, Snow Crash does. It will be interesting to see whether the decision to interleave Bonanza and Juncto — the two novels that make up The Confusion — gives that volume more of a unifying shape. If by this you infer that I’ve been won over enough to complete the Cycle, you’d be correct, although I still have the feeling I’ll enjoy having read it more than I’m enjoying reading it. Because the most common emotion Odalisque evoked, like the two novels before it, is frustration. There is the question, for example, of what exactly Odalisque adds to the Cycle. Why do these 300-pages exist? The basic ingredients, after all, haven’t changed. The style is the same, pages and pages of talk relating events that happened elsewhere to other people; the overwhelming dumping of information is the same; and the sense that Stephenson’s main argument is that this period encapsulates the birth-pangs of the modern world is present and correct. The strongest justification I can come up with for Odalisque’s existence is that it’s a bit less annoying than Quicksilver and a bit more coherent than King of the Vagabonds. At times, it even seems like the book is in danger of developing a plot, although it always turns out to be just the natural momentum of historical events keeping the characters on the hop. On one level, this is a way of explaining of why we read any writer: because their particular vision of the world reveals aspects of it that we did not see, or did not see as clearly, or because their vision chimes with ours. (We read Neal Stephenson because we like his geekiness.) But it’s also implicitly both an argument for Stephenson’s focus on the Great and the Good of seventeenth-century Europe in his narrative — being the people who, via Stephenson’s protagonists, can express the nature of the times most clearly – and, perhaps unconsciously, a way of highlighting the arrogance of that argument. With this in mind, it’s notable that most of Eliza’s narrative in the book is couched in epistolary form. Initially this is satisfying because it gives us direct access to her way of seeing the world, but the ultimate point is that this form — a single viewpoint — never tells the whole story. In her last letter to Leibniz, Eliza meditates on the limitations of historical knowledge, with reference to the birth, or not, of James II’s heir. Was there really a birth, she wonders? If their was, was James II really the father? If he was, did the child really survive? And so on. “In a sense,” Eliza writes, “it does not matter, since that king is deposed, and that baby is being reared in Paris. But in another sense it matters very much…” (895). Truth exists, and truth can be sought, and in certain ways — such as Principia Mathematica — it can be found. But in other ways it cannot, and both kinds of truth (revealed and hidden) shape our world. Put another way — and Stephenson loves nothing more than to put something another way — all history is a form of cryptography. “In the plaintext story,” Eleanor writes, putting the unencrypted description of the burden she felt after the birth of her child into context for Leibniz, “it is a burden of grief over the death of my child. But in the real story — which is always more complicated — it is a burden of uncertainty” (906). That in a thousand details the Baroque Cycle is repeatedly and visibly not “what really happened”, then, is irrelevant. (If, to me, annoying.) The standard by which the story is asking to be judged (I think) is not a standard of detail, it’s a standard of the big picture: whether or not it fairly represents how the system of the world changed during the time in question. Again, this was clear from the start of Quicksilver, but Odalisque is more convincing as an argument for this particular slant on this particular period of history, largely because the Glorious Revolution feels like more of a meaningful change than (for example) the Declaration of Indulgence. It feels like an event that can function as a synthesizing narrative without having to be forced into an unnatural shape; and the pursuit of synthesis in politics mirrors the pursuit of synthesis going on elsewhere in science. In Daniel, in fact, the two come to be inextricably intertwined. The first mentions of Newton in Odalisque point out how irreconcilable his divergent interests seem. As Daniel puts it, observers are “trying to figure out whether there might be some Reference Frame within which all of Isaac’s moves make some kind of damned sense … You want to know whether his recent work … is a change of subject, or merely a new point of view” (665). Of course, in this instance we can see the Reference Frame before the characters, because we know how gravity links tides to comets and to the movements of Jupiter and Saturn. But Daniel, in particular, becomes obsessed with how the new scientific understanding of the world might link to a new political understanding of the world; as Eliza notes, he stakes everything on the Glorious Revolution, “not in the sense of living or dying, but in the sense of making something of his life, or not” (746). I said in my first post that I wanted to leave the question of whether or not the Cycle is science fiction for later. This seems to be a good time to visit that question, at least to reach an interim conclusion, and not just because Quicksilver was awarded the Arthur C. Clarke Award as the best science fiction novel published in the UK in 2003. The Cycle as a whole was later awarded the Locus Award for best sf novel, so clearly it’s not just an isolated group of judges who’re prepared to consider it as sf. There are several ways of responding to the question, I think. One is to say that it just doesn’t matter, to which all I can say is that I think it does: if we can read the novel as sf, it says something about the way sf is working in the early 21st century, and that to me is an interesting subject. Another response is to say that it’s trivially obvious that it’s sf: there’s Enoch Root’s longevity, for starters, not to mention the alternate-historical flavour of the whole project. But the most interesting response, I think, is the one that argues that Quicksilver is sf because it appropriates the tools of sf, because it forces us to ask what those tools are. One, perhaps, is the portrait of the world that suggests it is best described in terms of interconnection and the flow of information; that’s a familiar approach in sf, from Stand on Zanzibar through cyberpunk to a work like River of Gods; and it’s not only sf that does this, but it tends to only be sf that has the characters recognise their position in such a world and comment on it. (In fact, it’s possible to read Stephenson’s extreme enthusiasm for trivia as an argument that a way of looking at the world that emphasizes information to this degree will inevitably become overwhelming.) The build-up to the Glorious Revolution as portrayed in Odalisque struck me as sfnal for two more specific reasons, as well. First is the way that Stephenson clearly teases us with the alternate-history possibility of assassinating William of Orange: “If they happened to light on the particular stretch of beach where William goes sand-sailing, at the right time of the morning, why, they could redraw the map, and rewrite the future history, of Europe in a few minutes’ work”, says one character, to which another responds that “It is a clever conceit, like a chapter from a picaroon-romance” (652-3). And second, there seemed to be something sfnal in the way that Daniel perceives the coming revolution: as a gateway to a new world. It’s not just that who is looking matters; it’s how they’re looking. How very — dare I say it? — postmodern. The system of the world defines the world: it’s immediately after the Glorious Revolution, with its promise of a truer participatory democracy, that Stephenson tells us the word “shopping” has appeared in the English language. Welcome to consumerism. Equally, reality will always fall short of the idea, and it’s not a surprise that Daniel finds the Revolution, when it comes, somewhat anticlimactic, and makes plans to leave for another New World: he’s a utopian. He can’t stop chasing the future. All of which probably makes it sound as though I really liked Odalisque, when in fact I thought it merely not bad. Certainly the problems with the book are less pronounced than in the earlier installments – as all of the above hopefully demonstrates, I think this time you can actually draw a coherent argument out of it – but there is fundamentally too much stuff. Individual threads may be beautiful, but the tapestry as a whole is no better than workmanlike. To be clear, I don’t think this is a case of bloat: I think everything that is in the book is meant to be in the book, because I still think Stephenson wants us to see the hints of a System of the World that makes the relations between all the disparate elements of the narrative as clear as the relations between the disparate items of Newton’s research. That, I think, is meant to be the key, which like the key to Eliza’s letters would explain why there have to be five words every time one would do, which would unlock the encryption of this history, which would reveal the plaintext. It just seems like meagre reward. It did and then you went and spoiled it! But the most interesting response, I think, is the one that argues that Quicksilver is sf because it appropriates the tools of sf, because it forces us to ask what those tools are. I think by the end of the Cycle, it’s pretty clear that the whole thing is all about What This New Stuff Is And How It Works, and what could be more SFnal than that? The whole conceit of the series is also based on a familiar (but not exclusively) SF trick – using Somewhen Else to consider our own time. It’s hard not to look at Stephenson’s detailed descriptions of the dawning of what you might call the Age Of Capital and think of our own place at the beginning of the Age Of Information. This is surely the point – that it is not the great and the good who drive the modern world but the ‘slaves’ with space to dream. And the passage refers back to Jack bringing down the ceiling in Paris and forward to a scene under the same ceiling repaired in The Juncto.